Well, something has slipped into that spot I spoke about between Selfish and Selfless, and her name is Wendy. As you can see she was used as a breeding dog. She’s currently in KS and is the foster dog that I am going to take. 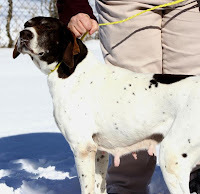 The reason she is coming to New England and that I can foster her is because the New England German Shorthaired Rescue League has a veterinarian in Willington, CT who will do her spay and a tummy tuck and make her look like a normal GSP. This organization has the resources and other rescues don’t so I knew we could help her. I met Wendy the other day when taking her pictures! She is a wonderful girl, showed nothing but wiggles and smiles! She was fine with other dogs, can ck on cats. I would have no doubt she would be fine with kids. This is one very sweet girl!!! She really needs a tummy tuck/ breast reduction. Poor girl! She is just precious! I will help in any way I can! Sounds like a lovely dog. Estimated at about 6 yrs old. So, Wendy is coming to Boston -- as a Foster -- but ready for lots of love, walks, and naps. I don't think she has ever been out of a kennel as she has been bred every heat cycle that she has had.